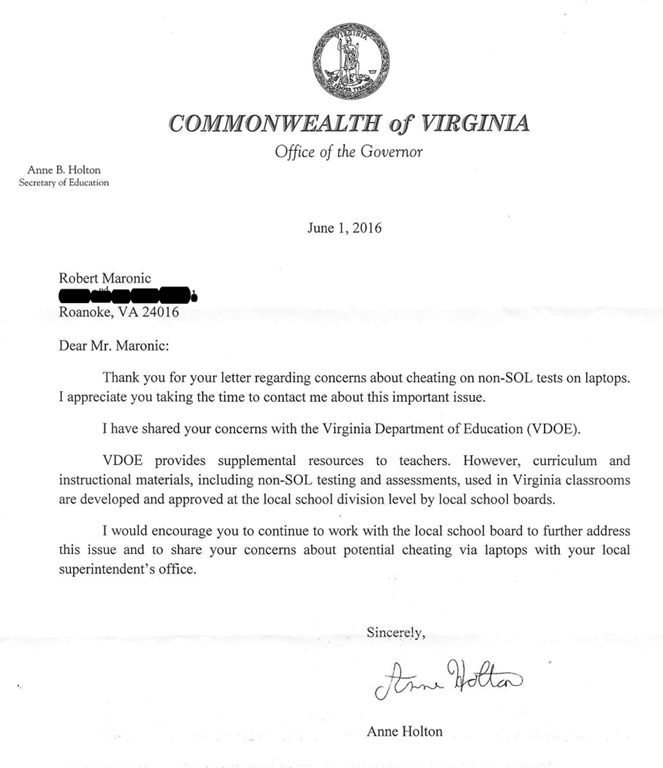 We have seen that a former Latin teacher in the Roanoke County school system alleged wholesale cheating on non-SOL high school tests in the system. And we have seen that the President of the Board of Education responded, in essence, that RCPS is doing something about the cheating and, besides, the State can’t do anything. So, of course, I filed a Freedom of information Act request with VDOE for the underlying public records. The response: A collection of emails and drafts of the Cannaday letter but no report of an investigation. If you’ve ever dealt with the bureaucracy you know that they don’t make a trip to the water cooler without writing a memo to file. So this means that they intentionally did everything by word of mouth. Even so, they created a paper trail. Elizabeth – I am going to review the draft letter with Dr. Cannaday over the next two days while he is here for the Board meetings. Can you give me some notes (either written or verbal) that provide more specifics about who you talked with, what they are doing about the concerns, etc. so that I can share those informally with Dr. Cannaday? FYI ‐ Mr. Maronic wrote a similar letter to our office as well. With input from DOE and our office, I mailed the attached letter to the constituent encouraging him to work with his local Superintendent as well as his school board to address his concerns. Well, let’s look more carefully at their authority. 8VAC20-131-110.A: “The standard unit of credit for graduation shall be based on a minimum of 140 clock hours of instruction and successful completion of the requirements of the course” (emphasis supplied). In short, the Board has “general supervision” of the public school system. In the exercise of that authority, it has specified graduation requirements that include “successful completion” of course requirements. They can fire the local Superintendent. So we have the Secretary of “Education,” the President of the Board of “Education,” and the Department of “Education” resolutely refusing to deal with cheating and lying about their ability to do so. Unfortunately, this nonfeasance is part of a pattern: In 2009 VDOE conducted an investigation of misuse of the VGLA to boost pass rates in Buchanan County. The County that year had the largest VGLA participation rate in the state, ahead only of Richmond. The VDOE report said: “The Superintendent stated the he had encouraged the use of VGLA as a mechanism to assist schools in obtaining accreditation and in meeting AYP targets.” Instead of firing the Superintendent for deliberately cheating (on SOL-equivalent testing! ), VDOE required that he prepare a corrective action plan. The folks in Roanoke County can vote out their School Board for allowing (and, probably, covering up) this cheating. We cannot vote out our mendacious bureaucrats or our term-limited Governor; at most we can hope the Governor will do his job to “take care that the laws be faithfully executed.” For sure, there is lots of room for him to do that in our “education” establishment.